Jacob Waguespack and JoJo Romero Should Be In The Phillies Major League Spring Training Camp! Two of the best pitchers in the upper Phillies minor league system were not invited to the major league spring training camp as non-roster invitees. Hard to believe, Harry! The big team could have used both big righty Jacob Waguespack, and lefty JoJo Romero last night in Tampa and today at Spectrum Field in Clearwater. The last time I saw them they were standing around over at the Carpenter Complex last week where the minor league pitchers and catchers were working out. Last night the Phillies lost to the Yankees over in Tampa because Franklyn Kilome allowed a run in the eight inning and then Ranger Suarez allowed a game winning home run in the bottom of the ninth innings after a Scott Kingery home run tied the game up in the top of the ninth. Today, it was Jose Taveras who allowed a couple of home runs in his 1.1 innings in the 11-6 lost to the Tigers at Spectrum Field. 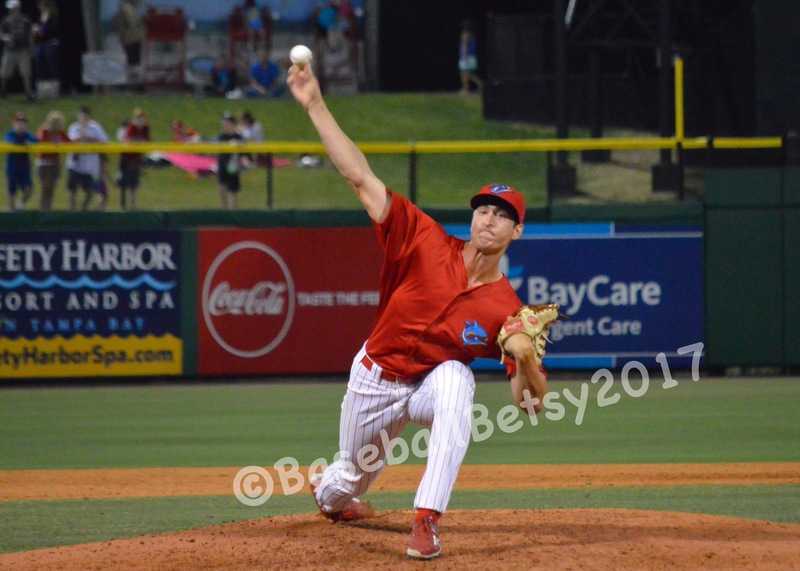 We watched all of the five pitchers last season when they pitched for the Threshers in Clearwater. They all pitched well but it was Waguespack and Romero who impressed us the most and both finished strong. We watched Waguespack on MiLB-TV pitch his final game in a AAA International League playoff game. He pitched seven brilliant innings for Lehigh Valley allowing only four hits and striking out seven Yankees farmhands for SWB only to lose 1-0. Romero pitch his final game of the season for Clearwater in a win over the Dunedin Blue Jays. He allowed only four hits over six shutout innings. In Romero’s ten starts in the Florida State League he went 5-2 for a 2.24 ERA. He averaged nearly a strikeout a inning. It would have been interesting to see what Waguespack and Romero could have done in the Grapefruit League games. So far Kilome, Suarez and Taveras have struggled. 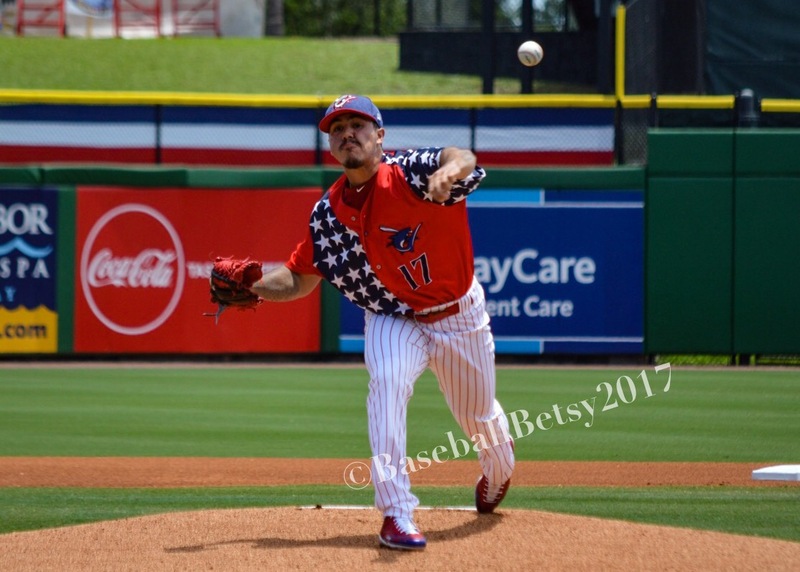 This entry was posted in 2018, February and tagged Baseball Betsy, Baseball Ross, Jacob Waguespack, JoJo Romero, Philadelphia Phillies, Phillies 2018 Spring Training. Bookmark the permalink. 1 Response to Jacob Waguespack and JoJo Romero Should Be In The Phillies Major League Spring Training Camp! May be incorrect on this….but are not invitations to big league camps dependent on 40-man roster placement?
. Kilome, Saurez and Traveras are all on the 40….JoJo and Wags are not…maybe that is the reasoning.